I think both Paraguay and Colombia might have scored 12 tries against Guyana. dwpeate wrote: I think both Paraguay and Colombia might have scored 12 tries against Guyana. I think Colombia only got 11. Bunch of scrubs. One try and three penalties. Final result 45-0 for Colombia. Well, that was also unexpected. Mexico just had nothing to offer in this game, zero attack and a sloppy defense. Colombia honestly didn’t look that amazing but they were aggressive. I also really liked their scrumhalf who got the ball out very quickly and cleanly and some of their players (in particular their 15) made very good open field tackles. 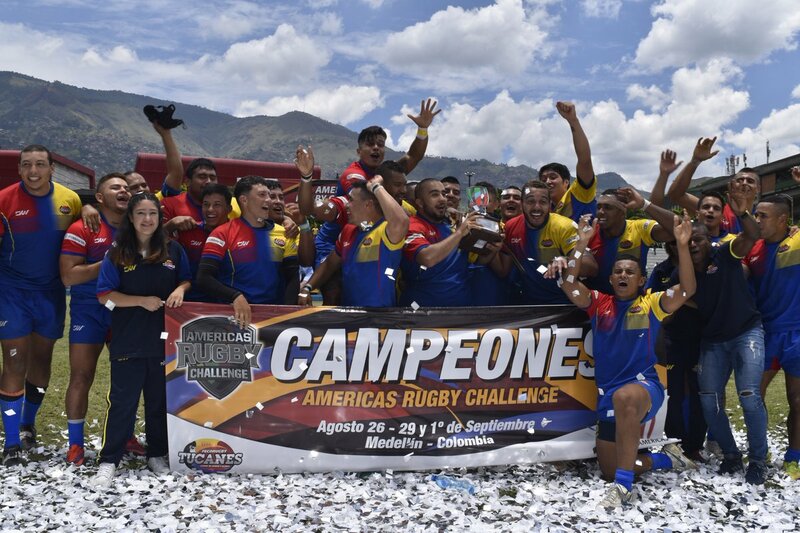 Los Tucanes are the Champions of the first ARChallenge 2018, and surely will be movements in the WR Rankings. what about Guyana vs Mexico? Colombia has risen above Paraguay, I believe to 37. This is what someone said during the game. Rubbish game, to summarize bad performance by both sides..
A few high tackles and missed calls by the Referee, No cohesion at the breakdown. Defence non existent by both sides..
Congratulations to Colombia, they have been improving dramatically. Colombia is now 7th in the Americas. Wooo and 5th in South America. They’re ranked 36th overall, the best they’ve ever been. I don’t think they’ve even been in the 30s before. Would love to see them take on a full Chile side next year to gauge where they’re really at (they played Brazil and lost like 54-10). Maybe if they modify the format of the South American 6 Nations. Doesn’t it change up each year? They didn’t play Chile last year so I thought maybe that’d be a matchup this year. Also frankly kind of stupid that it’s called the 6 Nations but doesn’t follow the same format at all. Maybe if the ARC moved to August with ARCh they could do something like that. All that’s needed is time for 2 more games. Last time they divided it in conferences, with each conference only playing teams of the other one. Chile and Colombia were both in the same conference. It would seem now would be as good a time than ever to make it a proper 5 week tournament given how dominant Paraguay and Columbia were in the ARCh. If they can find room in the calendar for it, and figure out a way to make it cost effective, it would mean all South American nations would be playing a minimum 8 test matches a year. Just saw this... so Colombia might really be the next big thing, right? rey200 wrote: Just saw this... so Colombia might really be the next big thing, right? Ha...at the very least they'll help in the push to transform the teams in the region into competitive forces among one another.